A long-distance migrant, summering on the northern Great Plains and central Canada, and wintering primarily in the Southern Hemisphere along the western South America coast. They are often seen following plows in farm fields as they kick up insects. Compare to the very similar Bonaparte's Gull which migrates through the state, and also the Laughing Gull (rarely seen in South Dakota). Habitat: Nests around marshes, sloughs, and wetland vegetation around lake margins. Prefers large continuous areas of such habitat. Also seen feeding around farm fields, pastures and prairies, and flooded fields. Diet: Mostly insects in summer, also earthworms, crustaceans, mollusks, small fish, and some seeds. Behavior: Feeds in a variety of ways, from catching insects in flight, walking on the ground and picking up food items, swimming, or wading in shallow water. Song: A harsh cuk-cuk-cuk, with occasional interjected screaming keeah-ah keeah-ah. Migration: Summers in northern Great Plains and central Canada. Winters along the Pacific Ocean in Central and South America. 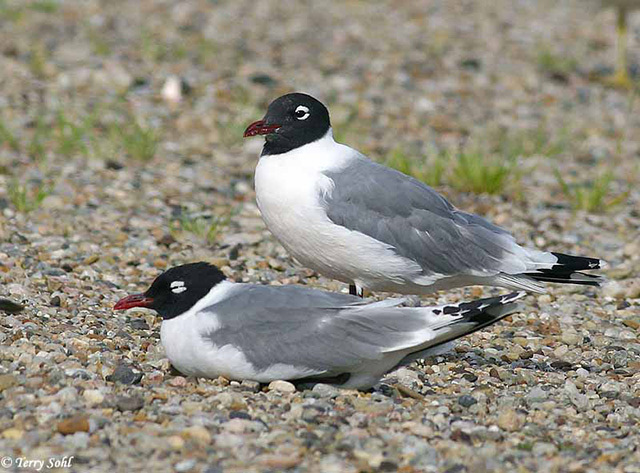 Similar Species: Bonaparte's Gull, Laughing Gull. See Identification Tips. Conservation Status: Uncertain status, expanding range in some areas but sharply reduced numbers in others. Additional Photos: Click on the image chips or text links below for additional, higher-resolution Franklin's Gull photos. South Dakota Status: Common migrant throughout the state. Common summer resident in parts of the northeastern part of the states. Uncommon summer visitor in other parts of the state.